The last time the kids and I went to the library I checked out this great kids craft book, "Green Crafts for Kids" by Emma Hardy. 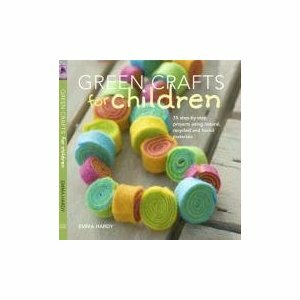 The book had a lot of easy, creative and quick projects that used many basic household items that didn't require a special trip to the craft of fabric store (bummer). The first was homemade play dough. I had never made it before but I remembered from childhood playing with home made play dough that had a very strong smell that I wasn't too fond of. I decided to add a little vanilla extract to the dough mixture and boy did it smell GOOD! So good in fact that Rian, overwhelmed by temptation, took a little nibble....then spit it out! I guess she forgot how much salt she helped me add to the recipe! The second craft we tried was making cardboard sandals. We had some leftover cardboard boxes from some newly installed outdoor lights (thanks Gary) which we cut up to make the sandal soles. The straps were made from an empty cereal box and then embellished with some cutout flowers from the latest Martha Stewart magazine. Here are some pictures of our crafty sandals. For one reason or another the girls have recently decided that they don't like to eat spaghetti (which happens to be one of Gary's favorite dinners). Kami claims that the sauce is too "spicy" and Rian is still just picky. I tried adding meatballs since they were into the "Cloudy with a Chance of Meatballs" movie which worked for one round of spaghetti and meatball dinner. The last time I made it for dinner I promised I would give the girls their own "long" plain noodles after they ate their spaghetti/sauce/meatball dinner. Here is what happens when you give long plain noodles to my silly girls!